Evil versions of the Dark Knight are coming to terrorize Earth this September, as DC teased early details on a series of seven one-shot comics that tie into the upcoming DARK NIGHTS: METAL event. Each one-shot story spotlights a different, corrupted version of Batman spawned from the Dark Multiverse to wreak havoc on Earth. “With names like The Red Death, The Murder Machine, The Dawnbreaker, The Drowned, The Merciless, The Devastator and The Batman Who Laughs, it’s pretty clear that these creatures mean business and prove just how dangerous the Dark Multiverse will be for DC’s heroes,” said Patrick McCallum, DC Entertainment Executive Editor. The terror begins on September 20 with BATMAN: THE RED DEATH #1, by Joshua Williamson (writer) Carmine Di Giandomenico (artist), followed by BATMAN: THE MURDER MACHINE #1, written by Frank Tieri with art by Ricardo Federici on September 27. Writer Sam Humphries and artist Ethan Van Sciver will team up on BATMAN: THE DAWNBREAKER #1, on sale October 4, with Dan Abnett and artist Philip Tan collaborating on BATMAN: THE DROWNED #1 October 18. The month concludes with Peter J. Tomasi and Francis Manapul on BATMAN: THE MERCILESS #1, on sale October 25. November features two additional one-shot titles, BATMAN: THE DEVASTATOR #1 (on sale November 1) and THE BATMAN WHO LAUGHS #1 (on sale November 15). The presence of these malevolent characters infects some of DC’s deadliest Super-Villains, who are ready to take down Gotham City once and for all. But rest assured, DC’s bravest heroes aren’t rolling over for anybody and are ready to fight for the city’s very soul in “Gotham Resistance,” a series of crossover stories beginning with TEEN TITANS #12 written by Benjamin Percy with art by MIrka Andolfo (on sale September 13), NIGHTWING #29 by Tim Seeley and Paul Pelletier (on sale September 20) and SUICIDE SQUAD #26 by Rob Williams and Stjepan Sejic (on sale September 27). 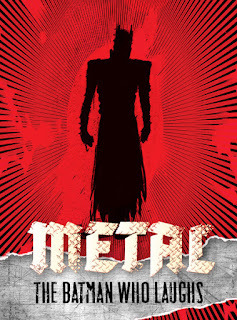 ”With the combination of an event comic helmed by two of the most talented creators in comic history a legion of evil Batmen and crossover titles that show just how deeply this event impacts the DCU, fans will know now more than ever that DARK NIGHTS: METAL is something not to be missed,” said McCallum. Each $3.99 BATMAN one-shot ships with a special foil stamped cover featuring a protective UV coating, with art by fan-favorite creator Jason Fabok (JUSTICE LEAGUE: DARKSEID WAR, SUICIDE SQUAD: THE BLACK VAULT, BATMAN ETERNAL). Issue #1 of DARK NIGHTS: METAL available now. For more information on DC, visit the DC website,www.dcomics.com, or download the DC All Access app, available for both Apple and Android devices.